This report presents an analysis of the current distribution of the building stock in the nonresidential sector, which allows identifying the most important building types. 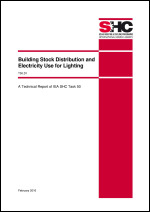 The report also presents the current average energy intensity for electric lighting for each building type as well as characteristics of existing lighting installations in these buildings. The analysis concludes that five building types cover the largest floor space area: 1. Offices, 2. Educational buildings, 3. Wholesale and retail trade, 4. Industrial buildings, 5. Agriculture buildings. Three other non-residential building types should be given a second priority: 1. Hotels and restaurants, 2. Hospitals and healthcare, 3. Sports buildings. Data from Sweden, the Netherlands and the United States indicate that fluorescent lighting is clearly the dominant light source in non-residential premises, that LED lighting is still very scarce and that there are still many incandescent light sources installed in non-residential buildings. This report presents a literature review about energy-efficient retrofit of electric lighting and daylighting systems in buildings. The review, which covers around 160 research articles, discusses the following energy retrofit strategies: replacement of lamp, ballast or luminaire; use of task-ambient lighting design; improvement in maintenance; reduction of maintained illuminance levels; improvement in spectral quality of light sources; improvement in occupant behavior; use of control systems; and use of daylighting systems. The review indicates that existing general knowledge about lighting retrofit is currently very limited and that there is a significant lack of information concerning the actual energy performance of lighting systems installed in the existing building stock. The resulting key directions for future research highlights issues for which a better understanding is required for the spread and development of lighting retrofit. This document presents a monitoring protocol to assess the overall performance of a lighting and/or daylighting retrofit of a building. This protocol covers four key aspects: 1. Energy use; 2. Retrofit costs; 3. Photometric assessment; 4. User assessment. This document develops each aspect in detail, presenting the required measurements and necessary equipment as well as providing guidelines for data analysis. The protocol is written as a general guideline document which could be used by non-expert assessors. A step-by-step general procedure is described, including five main phases, where each phase is described in detail, including the required documentation for two distinct monitoring levels: a ‘basic’ and a ‘comprehensive’ monitoring level. This report presents the general lessons learned from the investigated 24 case studies from 10 countries.